ing's new CD, entitled Stagger & Belligerence is being released now by Heyday Records featuring "Not Dead, Not Dying" (which, in demo form, has received thousands of plays via MP3.com). Other tracks include the Britpop gem "Better Don't Do", the pile-driving "Brotherhood Way", the southern-tinged stomper "Connect In Grey", and the soulful country-western dirge, "Miracle Song". Stagger & Belligerence reflect ing's full vision of Americana-inspired folk roots blended with blistering 60s-meets-late 80s British rock. ing has released a video for "Not Dead Not Dying" made by acclaimed NY animator John Schnall. A Flash version of the video can currently be seen on ing's website. We are pleased and excited to announce ing's signing with Heyday Records. Heyday Records, has released music of various genres over the course of their 14 year existence. Officially established in 1989, some of Heydays early artists have included Penelope Houston (The Avengers), Club Foot Orchestra, Connie Champagne, Buck Naked and the Bare Bottom Boys and The Aqua Velvets. Heyday continues to remain fiercely independent and steadily harvests the sounds of the indie scene. Over the past few years, a new crop of artists have popped up under the Heyday umbrella; The Dave and Deke Combo, Phoenix Thunderstone, Baby Snufkin, The Aquamen, Marty Willson-Piper (guitarist of The Church), The Duo-Tones surf music pioneers Paul Johnson (Bel Airs, Surfaries) and Gil Orr (Chanteys), David J (Bauhaus / Love and Rockets) and fellow San Francisco band The Slow Poisoners. With the signing of ing and the release of Stagger & Belligerence, the eagerly anticipated follow up to their 1999 debut EP Liberty, Heyday continues their tradition of releasing quality new music and their support of emerging talent. Rolling Stone has called Heyday Records "one of the ten most adventurous small labels in the world". For more information on Heyday Records visit www.heyday.com. Last year you were kind enough to vote for ing as "Best Local Rock Band" in the Bay Guardian's 2002 Best of the Bay Reader's Poll and we were truly grateful for your continued support. Now in 2003 it seems we have twice the gratitude to pass along thanks to your voting for us for BOTH "Best Local Band" in the SF Weekly and "Best Club Band" in the San Francisco Magazine 2003 Best of the Bay Reader's Polls. Mere thanks cannot even come close to expressing how much we appreciate your support over the years both in the clubs and at the polls. So from Sean, Mark, Lliam and Ty we would like to extend our most sincere gratitude--we couldn't do it without you. See you at the clubs. 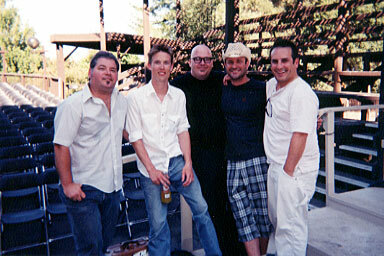 June 25, 2003 ing performed a short but vivacious set for about 1100 folks at the Mountain Winery in Saratoga opening up for blues guitar prodigy Jonny Lang. The fans at the sold out 1600 seat venue were very enthusiastic and welcoming and Jonny and his band were the nicest group of guys you could ever meet. In fact, Jonny's keyboardist Bruce McCabe was even kind enough to lend his considerable musical talents to "Not Dead Not Dying" and "Miracle Song", which made for a very exciting performance. The folks at the Mountain Winery and BGP were extremely accommodating and a blast to work with. We hope to be back again real soon--we'll keep you posted. ing's sound is a combination of timeless American roots rock straddling the line between late '80's Britpop and '60's vintage garage; some have described the band's sound akin to Husker Dü channeling PJ Harvey via Pete Townshend and Neil Young. Founded in 1996, ing has matured into a powerhouse of strength, groove and jam abandon. ing has recently won a number of Readers Polls in Bay Area press including San Francisco Magazine (July 2003) and San Francisco Weekly (April 2003). 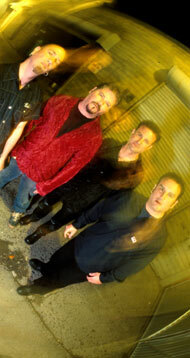 In 2002, ing was a poll-winner for best band in the San Francisco Bay Guardian. For more information, visit ing's website at www.ingdom.com or write to inghead@aol.com. EDITOR NOTE: For more information, photos, CDs or to be added to guest lists for upcoming shows, please call 415-332-0718 or write to inghead@aol.com. Thank you for listening!